The Facilities Management department operates and maintains the campus district energy system (DES). Phase 3 of this $14 million project was completed in October 2011 and has been operating 24 hours a day ever since. The DES is a system of pipes and equipment that provides heating and cooling to ten academic buildings totalling about 80,000m2. Distributed water source heat pumps within the academic buildings take ambient temperature water and convert it to hot (45C) water and cold (7C) water, which is required to keep the buildings comfortable. 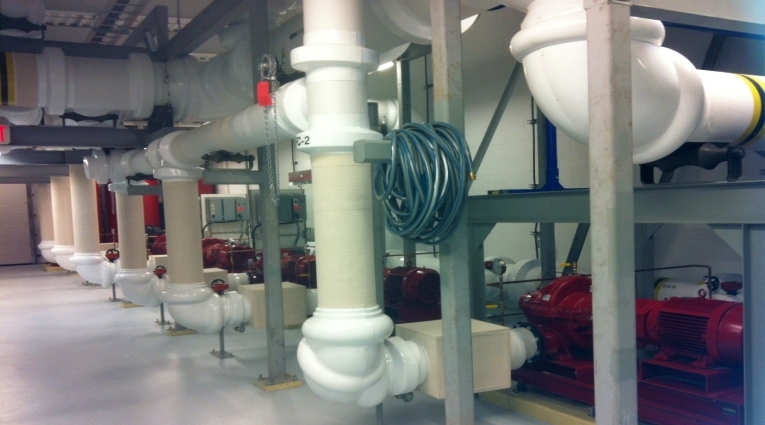 The water is distributed around the campus by pumps located in the geoexchange building. The ambient temperature range (8.9C to 23.9C) is maintained by geothermal temperature exchange. Additional heating is provided by a high efficiency condensing boiler and additional cooling is provided by two 400 ton evaporative cooling towers. Why was the DES created? UBCO Academic & Admin buildings were known to have differing heating/cooling profiles or usage. In some cases, buildings would reject surplus heat energy while outside temperatures were as low as -2°C. Other buildings would meanwhile experience a heating demand at outside temperatures of +15°C. DES allows our buildings to utilize this rejected energy. UBC has set aggressive GHG reduction targets, to exceed Kyoto Protocol requirements. Recapture of waste heat was therefore desired to further reduce harmful GHG emissions from natural gas fired building heating systems. Buildings that reject energy can feed the surplus energy to other facilities that require it, as long as all facilities are grouped together in an Energy Sharing Closed Energy Loop format. Supports adaptation to future environmentally friendly technologies using low temperature energy sources. 2004 – Clean water is required for a trout research project. A 750’ deep well was drilled but was found to be dry. A local hydro geologist suggested drilling to the east of campus where there is a known aquifer. Test wells produce excellent results, up to 1200 US gallons/minute. As part of an ongoing partnership between UBC Okanagan and GE Water & Process Technologies, a Proof Not Promise’s Award was presented to the Geothermal Facility as recognition of a joint project that realized a reduction of corrosion rate in the District Energy geothermal loop by 92%. The next stage of development of the DES is to prepare it for increased capacity in order to handle future campus expansion. The two areas of improvement will concentrate on increasing the heat rejection and increasing the system flow to the buildings. Building optimisation is also ongoing in order to reduce the DES energy consumption of each building. Facilities Management welcomes discussion on this system, and opportunities exist to learn from this project. Please contact our Geothermal Manager, Colin Richardson, if you or your department wish to know more, or to arrange a visit: (250)807-9144 or colin.richardson@ubc.ca.